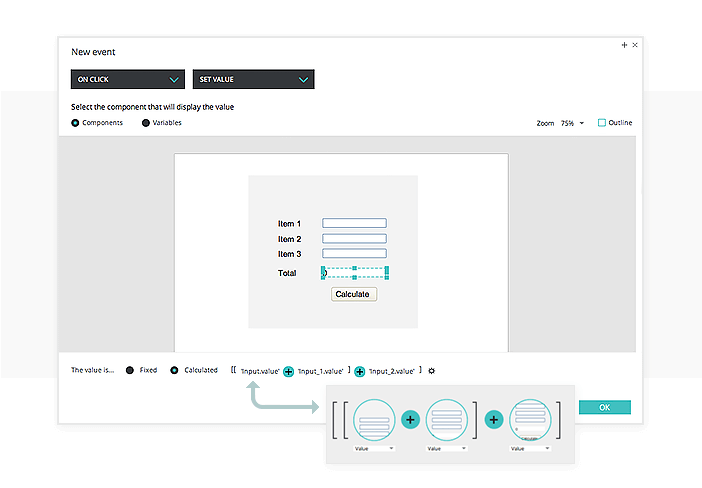 Add mathematical expressions to your prototypes. In our example, the total of three numerical values you enter are calculated when you press the “Calculate” button. In a new prototype, drag four Input text Fields, four Text widgets and a Button to the Canvas, and align them as you can see in the example. Select the Button, go to the Events palette and add an “On Click” + “Set Value” event, selecting the Input Text Field where the total will be displayed as the target of the action. For the value, select the ‘Calculated’ radio button and the ‘Add expression’ text. You’ll see the Calculated Expression builder appear.